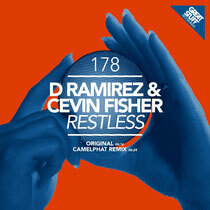 This week saw the release of ‘Restless’, a new collaborative track between D.Ramirez and Cevin Fisher. D.Ramirez, with a career that spans over 15 years, has cemented his status as a UK house producer/DJ. Cevin Fisher has enjoyed an equally fruitful career and is another artist who is continuing to pioneer the genre after over 15 years in the game. ‘Restless’ is a pumping techno-house track with an infectious spoken vocal and a swelling, syncopated bassline. Full of energy, the track slowly builds into huge drops enforced with old school keys and thumping drums, capturing elements of both their styles. Cevin Fisher is the producer responsible for a plethora of house-anthems including tracks like ‘The Way We Used To Do It’ and ‘The Freaks Come Out’. Have a listen below, it’s out now on Great Stuff Records.